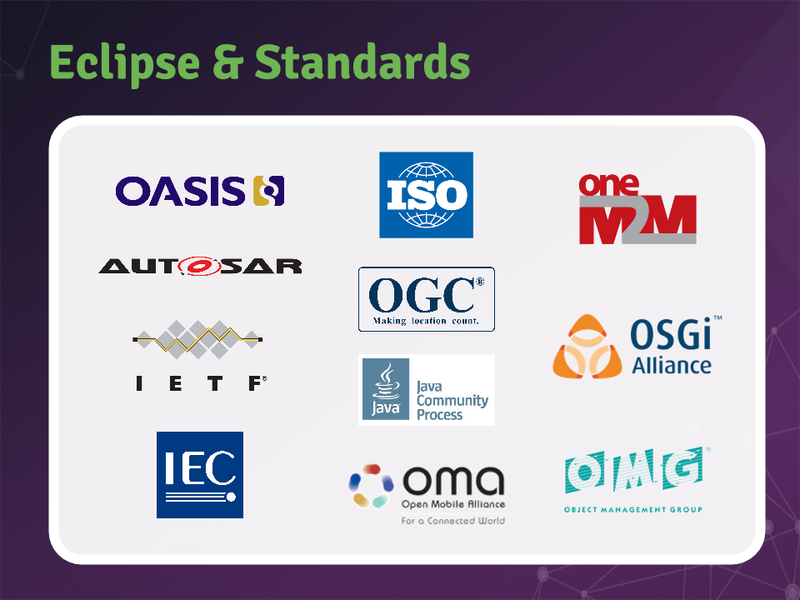 Did you know that the Eclipse Foundation is home to many open source implementations of industry standards? From IETF to ISO to oneM2M or OASIS, we have many open source projects that provide industrial-grade implementations that anyone can use to evaluate a given standard, or to effectively use it in their commercial solution. We do believe that open source is key to the adoption of standards, and in a presentation I gave last week at an Open Source Think Tank organized by IEEE, I shared some thoughts on what makes a standard successful, as well as how Eclipse has proved with recent success stories that open source and open communities are a key factor. The two examples I used in my presentation (see the slides at the end of this post) originate from the Eclipse IoT community. OMA (Open Mobile Alliance) LWM2M is a standard for doing device management of IoT devices (i.e remotely monitor the device’s health, upgrade its firmware over-the-air, etc.). The first drafts of the standard have been published less than 4 years ago and today, LWM2M is already used in commercial products, and has a thriving community of developers and contributors gathered around two Eclipse open source projects: Eclipse Wakaama, and Eclipse Leshan. I think you will agree that this is the kind of timeline you would like to see for all standards! The other example is MQTT, a very popular IoT protocol that I’m sure you’ve heard about! 🙂 In just a few years, it went from a de-facto standard to an actual OASIS and ISO/IEC standard. Having a rich ecosystem of open source MQTT implementations (including Eclipse Paho clients, and the Eclipse Mosquitto server) certainly helped the standards organizations to pin down the issues that need to be fixed in the spec much faster. What’s more, open source projects will also fuel the future of the MQTT specification, as they allow for new ideas to be explored (see e.g this recent work on MQTT-SN). 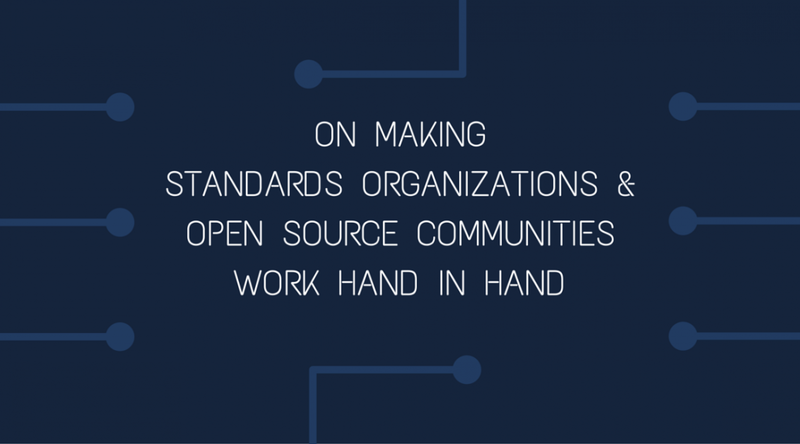 My hope is that Standards Developing Organizations will start embracing open source initiatives more and more. Open source communities are a great place for innovation, and can host standard implementations that sometimes actually become reference implementation. They also complement very well the role of the SDOs, which are here to enforce some needed processes when it comes to evolving a standard, anticipating incompatibilities or corner cases, etc. As mentioned above, here are the slides I used during my presentation. I am looking forward to hearing your comments and feedback. I am not sure at which point in the presentation you had the impression I was ever promoting the “one protocol to rule them all approach”. You will find many examples of me stating the exact opposite, actually, including in this very presentation where I am sure you have noticed that I talk about more than one protocol, right? Doing so would provide a great service to all those prospective IoT developers that don’t want to be concerned with the various emerging standards and early protocols that implement them (at least for the time being), and do something useful at the application layer without being locked into a particular messaging protocol or implementation/framework…e.g. Some people might even recognize the current flurry of new protocols and protocol standardization as somewhat historically familiar…i.e. we’ve been through this before (file transfer, then messaging middleware, then rpc, etc). it would be nice to help avoid the commercially-induced battles and subsequent developer confusion and disillusionment. Open source leadership could help avoid that. What happened to my response posted as a comment to this blog? It seems to have disappeared. Opps…my mistake…it is above. Apologies. Something is broken about the comments on this blog. Sometimes I see only the first two comments, sometimes (after refresh) 4 comments when there should be 5 etc.